Having custom built mouthpieces for thousands of trumpet players, I have some insight I would like to share with you. Despite the great number of professors and self-proclaimed experts spouting that equipment cannot solve range and endurance challenges, my experiences working with players of all levels has proven that Rim shape and Cup depth are almost always contributing limiting factors. By adjusting these two components, I have witnessed amazing breakthrough moments by players almost daily for the past two decades. Is it possible that Rim shape and Cup depth changes could unlock your potential to play higher and longer? The answer is quite possibly yes, but often this depends on a full range of factors including your approach to producing tone and your willingness to break old habits. Finding the correct Rim shape requires some experimenting with variations based on your personal history. I typically collect information on what has and has not worked for you in the past including the time periods in your life that major changes occurred. For instance, telling me that you regularly played above high C through your late teens and 20's before taking 20 years off the horn is very helpful. You may go back to your original "go to" mouthpiece only to find it feels limiting. The reality is that your body, dental structure, physical approach and mind set have changed since your last successful period of playing. Why do we expect everything to work with generic equipment in the first place? Seriously consider this question for a moment before reading any further. Would you expect your grade school shoes to fit you today? Take that concept a step further. Would you get on the highway and drive 75-85mph every day in the same car you drove when you were 18 years old? If you are 18 years old, would you drive that fast in traffic in this 1970 Buick? Common sense would tell most of us that what worked in the past should work again, today. Why fix something that isn't broken is what I've head from most educators and professors. It really bothers me that these words are spoken in the context of a private lesson where the student (you) is clearly stating that something is not working properly to produce your personal range and endurance goals. The arrogance of such a statement is 1) dismissive and 2) lacking in understanding of your personal situation. You are there, after all, to overcome challenges with the assistance of a paid professional. Yet this attitude is persistent in the western world of trumpet playing and teaching. So let's first admit that something is in fact "broken" and that we intend to diagnose the problem by exploring all contributing factors of tone production. Now let's list these contributing factors so we can get started. Once we break down the system into components, it become clear that every contributing factor is somehow related to another factor. Considering the environment, if we are playing underwater we will surely have trouble creating a tone due to the lack of air. A more realistic concern is playing in a very cold building with an organ that is low in pitch until the room warms up. While this is inconvenient, it is unlikely to be a major contributing factor to tone production, but I have encountered players who have difficulty getting their lips to vibrate against a cold mouthpiece. Now let's consider the instrument determining the character of the standing wave and amplification. You've probably heard that "insert name of famous trumpet player" can easily play a double high "insert note" on his/her "insert name of make and model" trumpet. And you've probably also heard something similar to, "Well that player could play that high on a garden hose". In reality, this is not entirely true. In fact, the success of anyone playing a specific range of notes on a trumpet or a garden hose is directly related to the design and integrity of the instrument. A garden hose 50' in length will play completely different than one that is 10' long. Likewise, a trumpet designed with a very small venturi, leadpipe and bell will play completely different than one designed .005" larger on the venturi, .020" larger on the leadpipe and with a faster tapered bell. In fact, it is quite possible that many players will find success on one of these variations while almost no success on the other when producing a specific type of tone color. Playing on the instrument that does not match the player's natural or preferred impedance can in fact reduce range, endurance and degrade motivation to play in general. For now, let's assume the environment is acceptable and the musical instrument in question is a perfect fit for the player. What can go wrong at this point? You could have a flawed approach to your physical performance technique, deficiencies in your physical nature or have mismatched mouthpiece design factors. Can we overcome our technique challenges? Yes, of course we can by educating ourselves on the factors involved and working on them thoughtfully over time. Can we change our physical nature? In most cases, the answer is no. We almost always have to work with what we're given with the exception of dental work and muscle development. And can we change the mouthpiece design? Yes. Of the three major factors that limit range and endurance, making changes within the design of the mouthpiece is the most straightforward approach to experiencing results quickly. 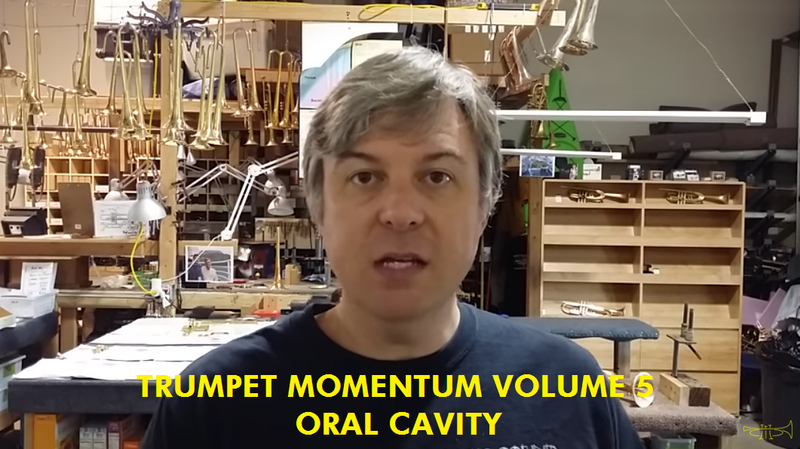 In fact, the reason many players require many years to achieve measurable results in terms of range and endurance is directly related to the player building up embouchure and technique to overcome the mismatched design of a generic instrument interface (mouthpiece). By finding the best shape and size early on in the process, players can achieve results more quickly as they work towards strengthening their technique. In my next blog, I will discuss the advantages and pitfalls related to various mouthpiece Rim shapes and diameters. Cup depth and shape will be presented in a dedicated blog entry as well. Until then, please comment with your experiences and questions below. If you are ready to explore the advantages of a custom mouthpiece fit to your personal needs, give me a call at 303.657.2747 or email me at harrelsontrumpets@gmail.com. Choosing the 5MM Body style that's best for your playing situation can make or break a performance. Projecting too little or too much results in more or less feedback to you, the player, and your ensemble. Small rooms often require us to play with finesse in a way that communicates with the audience with care. Medium and large rooms vary greatly in acoustic character posing even great challenges when balancing projection, efficiency and feedback. To simplify the selection process, I have created the following three question process that charts out the most common performance situations. 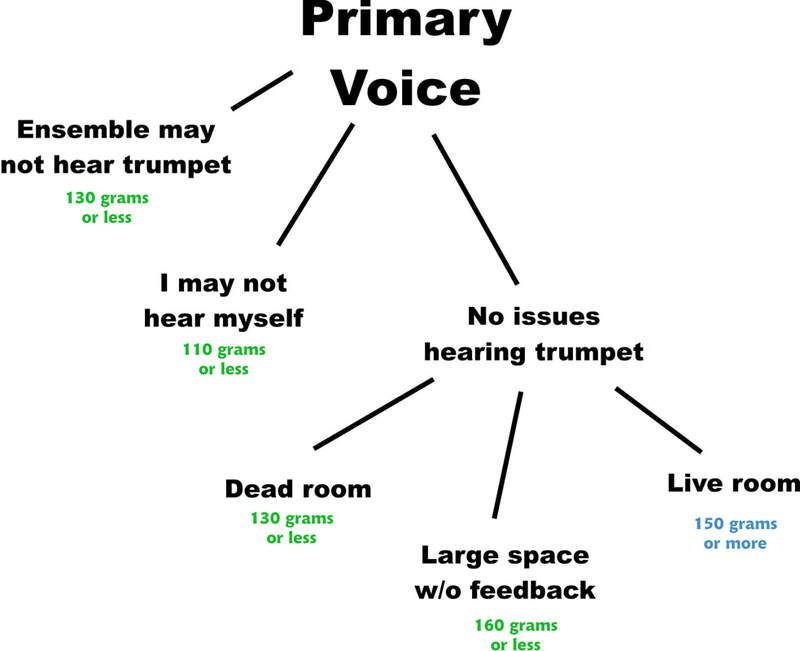 #1 - Does your performance feature trumpet as a primary voice in the ensemble? #2 - Is there potential that musicians in your ensemble may have difficulty hearing you play? #3 - Is there potential that you may have difficulty hearing yourself play? We launched our first Trumpet Challenge on YouTube this week. This project has been on my mind for years. I envision a fun, collaborative community of brass players sharing and learning along the way. The first few challenges will be simple with an element of humor. As we progress, they will become increasingly more difficult with crazy ideas mixed in here and there. I have prioritized these projects so you will see the Trumpet Challenge take form first and Let's Make This develop last. Ironically, I spend most of my time engineering, inventing and making things while playing trumpet only a few minutes a day. My goal is to bring balance to the various aspects of my professional life while sharing my knowledge with you. I would really appreciate your insight and comments on these projects. Do you have a suggestion on a topic to be covered? A burning question about physics or brass playing? Would you like to see me create a fork and knife with a CNC machine or get the inside scoop on hand carving a wooden frisbee? Post your ideas in the comments below and we'll get started! We take great pride in leading our industry in design, manufacturing and personalized customer service. SWE and VPS Technologies both set Harrelson apart in playability, efficiency and versatility. In addition, our manufacturing process incorporates the latest CAD/CAM software and precision CNC machining technologies. We are the only brass manufacturer to fully machine the leadpipe, tuning slide, bell crook and bell. Understanding our approach will reveal how Harrelson has created innovative solutions to your brass performance challenges. In addition to embracing physics and important modern technologies, we strive to offer solutions that meet your needs. 1) We have your size. 2) Every instrument and mouthpiece is completely adjustable. 3) We guarantee a perfect fit. Let's start with We have your size. We mean this literally. Our designs incorporate modular components allowing the instrument to fit YOU rather than the other way around. The traditional one-size-fits-all approach used by large corporations is streamlined for profitability whereas we build our instruments around the individual player. Every Harrelson instrument is completely adjustable in terms of air flow, flexibility, slotting, tone color, projection and even intonation tendencies. We guarantee a perfect fit to YOU and back it up with a 12-month exchange policy on all instruments and a 30-day exchange on all mouthpieces. VPS Series Instruments include all Harrelson trumpets built after 2015. VPS is short for Variable Performance System, which encompasses a series of inventions that allow any player to find the right balance of flexibility, slotting and air flow. Harrelson is the only manufacturer in the world incorporating VPS Technology into brass instrument design. This revolutionary approach guarantees that every one of our clients will find the perfect horn that exceeds their expectations. Harrelson VPS Instruments include the entire Summit and Muse series. We offer configurations in the keys of A, Bb, C and Eb designed for Jazz, Orchestra, Big Band, Solo, Symphonic Band, Commercial, Lead, Latin and Brass Quintet. We also offer a VPS Flugelhorn in the Bravura Series that will be introduced in late 2017. WHAT IS A CUSTOM HORN? Yes! In fact, every Harrelson instrument is custom built to your exact specifications. The Summit and Muse models offer more custom options than all other trumpet builders combined. This is a true statement and I've done the math. If you take every custom option available from every single company worldwide, you are left with a fraction of options when compared with Harrelson. Almost every client has a conversation with me directly to clarify options and expectations. This ensures that I build exactly what YOU want in terms of playability, tone, projection and aesthetics. We also discuss the model variations to find a balance between efficiency, price and wait time. The more efficient models like the Muse and Summit One require more time and machining whereas the standard Summit is usually the quickest build time available. Research and Development - I have invested over 50,000 hours developing solutions to meet the needs of every different type of brass musician. 5MM Modular Mouthpiece - The most comprehensive mouthpiece solution in the world and the only system guaranteed to exceed your expectation. A 30-minute mouthpiece fitting will take your playing to the next level immediately. VGR - The Adjustable Venturi Gap Receiver is possibly the most important innovation I have ever created and it is standard on all VPS instruments. The VGR allows you to fine tune the mouthpiece gap and venturi in a matter of seconds. This means you can adjust air flow, flexibility and slotting to your exact preference. Versatility - All VPS instruments are available in any configuration of leadpipe and bell allowing you to set up your horn for any type of playing. The VPS Summit was specifically designed to give the player more audible feedback than any other model including factory built horns. And the efficiency to weight ratio is highest within the Summit line meaning your horn will play easier and weight less. There is no difference in build or overall design when ordering these three variations. The real difference is only the way you configure the leadpipe, bell, tuning slide and trim options. The Standard Summit IS exactly the same as the Jazz and Lead versions. I have given them different names since trumpet players are accustomed to seeing these words in the model descriptions. I could generalize by stating that most Classical players use a specific leadpipe and bell, but in reality that configuration may be the perfect setup for a Jazz or Lead player. So I refer to all of these models as the "Summit" trumpet. Likewise, the Muse model is easily configured for any genre by adjusting the mouthpiece, leadpipe and bell. The final finish is always an up-charge on Harrelson instruments. Options include Acoustic Armour, Brushed Brass, Silver or Gold plate. Other options available include additional text, graphics, art, special bell bends, custom bracing shapes and just about anything you can imagine. The entire Harrelson line is the most reasonably priced instrument available today when you consider our custom options, service, playability, energy efficiency and quality. There is no competing model available anywhere in the world and thus Harrelson is in its own class. Pricing of each model varies based on the time and materials invested into the design and finished instrument. You can see our ever changing inventory of instruments here. At first glance, the sheer number of options available may seem overwhelming. I assure you, this is more fun than work. There are no right or wrong answers when choosing components and I will guide you through the entire process. It's almost like designing a custom home and the goal is for your horn to feel like coming home. The following is a brief overview of every option included on all Harrelson trumpets including links to resources within the HT website. Finishing your trumpet in silver, gold or Acoustic Armour may be preferable if you want a clean appearance. Mixing brushed and polished accents in any combination is common except in raw brass. Silver will tarnish over time, but much more slowly than raw brass. Adding carnauba wax to brass and silver finishes will also prevent tarnishing. Gold plate never tarnishes and looks great in a brushed finish. Guaranteed to fit YOU, the 5MM will allow you to play dark to bright, soft to loud, broad to focused and it is included with every Harrelson VPS Instrument. Our standard option is the original ergonomic design. Variations include the pinky rest with or without an open ring, cylindrical rings in 1/3" and 1/2" and the following custom styles; Flames, Summit One, Skeletonized and Ergonomic Arch. Finger buttons are now a modular 2-piece design allowing interchangeable threaded "bottoms" with inlaid or styled "tops". We offer 2 options to keep your third slide from falling onto the floor. The spring ball stop is the most popular allowing you to set a tension screw once. Then you simply pull the slide with extra force to remove for cleaning or greasing. The screw stop is a much improved version of the industry standard. How will you set up your Custom Harrelson trumpet? 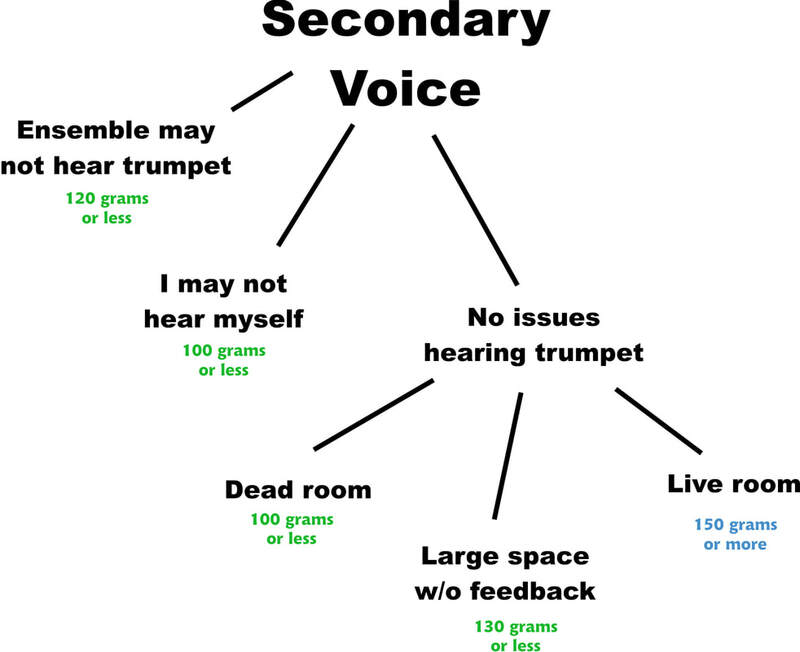 Feel free to share your ideal Harrelson trumpet configuration by leaving a comment. I also encourage you to check out my Facebook pages "Harrelson Trumpets" and "Jason Harrelson" where you can share ideas with current Summit trumpet owners. Beginning in 2017, we have limited custom trumpet and flugelhorn production to 24 orders per year. In addition, we will begin charging extra for option to have your trumpet designed and built "custom" in 2018. Please note that we invest a great deal of time and energy into fully custom built trumpets designed specifically for one person. For this reason, we adhere to strict cancellation policy to ensure your order receives the attention required to create the highest quality instrument possible. We encourage most of our clients to visit our Denver showroom to try out a full array of Harrelson trumpets and choose one in person. This will allow you to find the best fit, work through the 5MM Mouthpiece setup and VPS options with us in person. We can have your receiver custom engraved the same day so you can leave with your trumpet in your case.